Is Gretzky's move to Oilers from Racers fact or fiction? Few people know that Wayne Gretzky actually began his professional hockey career with the Indianapolis Racers of the World Hockey Association and that he didn't arrive in Edmonton until he was "sold" to the Oilers in 1978. The 20th anniversary of the Wayne Gretzky trade from Edmonton to Los Angeles is getting a lot of scrutiny this week because it changed the hockey industry. But the Aug. 9, 1988 deal that sent Gretzky, Marty McSorley and Mike Krushelnyski to the Kings for Jimmy Carson, Martin Gelinas, millions of dollars and three first-round draft picks was not the first time Gretzky was moved. Gretzky started his career with the World Hockey Association's Indianapolis Racers, not Edmonton. Officially Gretzky was "sold" to the Oilers, but there seems to be more to that story. Was the Edmonton Oilers' Stanley Cup dynasty between 1984 and 1990 born on a backgammon table in 1978 as part of a bet? Depending who you ask, the answer is yes and no. There is a side to this legendary tale which leads to a yes answer, but others will tell you that the story behind the Gretzky "sale" to Edmonton by Indianapolis was simply an economic deal that was designed to bail out a failing franchise, and that money was earmarked to have taken care of Gretzky's former teammates so they would get their paychecks until the end of the 1978-79 season. There is one indisputable fact -- Gretzky was moved by Indianapolis to Edmonton in what turned out to be the last year of play for the WHA, and the trade served as a significant building block in assembling one of the greatest teams in NHL history. But the story behind the trade has always been a little murky. In the summer of 1978, the 17-year-old Gretzky, who had been a Canadian icon since he was 6, signed a personal-services deal with Indianapolis owner Nelson Skalbania. But his Racers career would last just eight games. On Nov. 2, 1978, Gretzky would be the centerpiece of one of sports' strangest deals. Indianapolis wasn't a thriving hockey metropolis, but Gretzky's possible new city, Edmonton, was. Edmonton was also one of those "destination" cities. The NHL was allegedly interested in moving one of its financially failing teams there in the mid 1970s, and Edmonton was very receptive to either getting a failed team or being part of an NHL-WHA merger. Skalbania gave Oilers owner Peter Pocklington a chance to add a Canadian icon, Gretzky, which figured to bolster the Oilers' chances of getting into the NHL. There were two catches. Skalbania offered Gretzky's services to both Pocklington's Oilers and to the Winnipeg ownership group and "the Gretzky sweepstakes" would involve a game of backgammon. Winnipeg's owner, Michael Gobuty, backed off, but Pocklington did agree to Skalbania's backgammon challenge. Pocklington put up some of his artwork, while Skalbania is supposed to have anted up Gretzky. Over the years, some people have said that Skalbania really did set down those parameters and others have said the "bet" was just a fable. But there is one man who said the trade really happened over a backgammon board. "It all started in a private jet between Nelson Skalbania and Peter Pocklington, and it was a backgammon game with pretty high stakes as it turns out," said Larry Gordon, who was the Oilers' general manager in 1978. "Peter won that game and there was a wager made, some money exchanged hands and Wayne Gretzky, Eddie Mio and Peter Driscoll ended up in Edmonton Oilers uniforms. "Yes, they were part of the stakes of this backgammon game. There were some trades mentioned, actually we had our choice on the third player between Peter Driscoll and Blaine Stoughton and we took Peter Driscoll. "It was a cornerstone for Edmonton to build on. Later that year (1979, after the NHL expansion to Edmonton, Hartford, Quebec and Winnipeg, the four WHA cities) we took Mark Messier who had been in Cincinnati in the WHA in the NHL Draft. It really gave Edmonton a nucleus to go on and be very competitive in the National Hockey League." Gordon actually witnessed the high stakes backgammon game on the plane and was naturally rooting for his owner, Pocklington to win. "I saw it in progress and I knew the stakes were very high and I was cheering like heck for Peter," Gordon said. "I think there was some art involved from Peter's side and from Nelson's side it happened to be hockey players. It was kind of a strange transaction in the world of sports. I didn't care if Peter lost and lost his artwork. I was more interested that he won and get some hockey players to build our foundation with. Yes, he kept his artwork, ended up with some hockey players and paid out some cash in the transaction." The cash was reported to be $850,000. Skalbania was off the hook in paying Gretzky and may have been hoping that the money would keep the franchise afloat until the end of the year and maybe, just maybe, he would be bought by his WHA partners as a thank you for hanging in there should the NHL and WHA merge because Indianapolis was not going to be entering the NHL in any case. In 1976, the owners of the American Basketball Association's Spirits of St. Louis, the Silna Brothers of New Jersey, accepted a deal from the National Basketball Association that they would receive a share of TV revenues in perpetuity. The Silnas are collecting millions of dollars per year annually. The WHA was conceived by Dennis Murphy, the father of the ABA and worked out of the same playbook as the ABA. So it was possible that Skalbania could have received some money for going away if there was a merger. Gretzky put up big numbers as a member of the Racers, but with less than spectacular attributes and ability, no one could have envisioned him becoming an NHL legend. Sklabania had once owned the Oilers and brought Pocklington, an old business partner in real estate deals, in as a 50-50 partner in 1976. Pocklington bought him out shortly thereafter, and Skalbania would resurface in Indianapolis within a matter of months as the Racers owner. Gretzky was 17, rather small and somewhat slightly built. He wasn't hockey's best skater, nor did he have a great shot. His game was based on intelligence, natural ability and a knack for somehow hiding from trouble on the ice. He was also a great passer. The Indianapolis Racers would soon fold after the Gretzky deal. Winnipeg passed on Gretzky because of his size. Gretzky also had signed a $1.7 million personal services contract with Skalbania and that might have also had something to do with the Jets' decision. Sklabania's Racers had a bad lease with Market Square Arena, and Indianapolis had at best a lukewarm interest in the WHA and hockey in general despite a long history of minor-league hockey in the city. "I don't believe so, not at that time," said Gordon, on whether or not Gretzky could be viewed as someone who had the ability to become hockey's No. 1 force and actually change the game from a United States regional game to a national entity. "Scouts obviously felt he could be a tremendous player. I don't know if anyone in their right mind at that time thought he could be the dominating force he has been to the game of hockey. In the long run, especially Wayne ended up in Los Angeles, it was good for the game of hockey." Gordon was the witness to history, but would eventually be replaced by Glen Sather as the Oilers' general manager when Edmonton entered the NHL. Gordon left Edmonton for Wichita where he established the Central Hockey League's Wichita Wind in 1979, an Oilers' affiliate. Gordon went onto owning a number of minor league hockey teams including Muskegon and Cleveland of the International Hockey League. Sklabania would eventually become a part owner in the NHL with the Calgary Flames for a brief time. 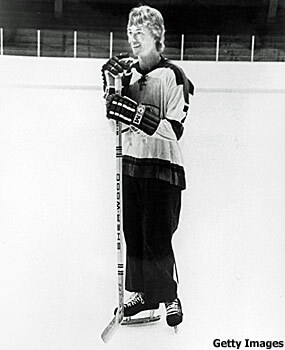 Gretzky had 46 goals and 110 points in his first year and was the WHA rookie of the year. He had 43 of those goals and 104 points in an Oilers uniform. Sklabania pulled the plug on the Indianapolis Racers on Dec. 15, 1978 and by spring 1979, the NHL would expand to Edmonton, Hartford, Quebec City and Winnipeg. The four teams paid $6 million each to enter the league. The owners of the Birmingham Bulls and the Cincinnati Stingers were each given a check for $1.5 million to go away. It wasn't quite the deal that the Silnas made with the NBA, but the Bulls and Stingers ownerships did get something. Whatever the truth is or isn't, the Gretzky transaction was the fundamental building block that started Edmonton on its way to win four Cups between 1984-88 and a fifth without Gretzky in 1990.